This very unusual and intriguing name is of early medieval English origin, and a good example of that sizeable group of medieval surnames that were gradually created from the habitual use of nicknames. These were given in the first instance with reference to a variety of characteristics, including supposed resemblance to an animal's or bird's appearance or disposition. Alp, Alpe, Alps and Alpes, derive from the Middle English vocabulary word "alpe", bullfinch, given as a nickname to someone who bore some fancied resemblance to the bird, perhaps favouring bright colours or possessing a sweet singing voice. Other medieval surnames from bird names include Lark, Swan, Nightingale and Hawk. 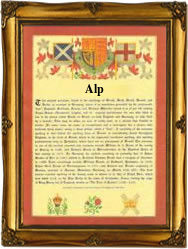 In some few instances of the surname Alp(s), the derivation may be from the Old French "alpe(s)", high mountain, pasture on a mountain-side, and thus a topographical name for someone living on or by such a place. Among the recordings of the name in London are the marriages of Hester Alpe and Thomas Stanton on January 11th 1579 at St. Lawrence Jewry, and of Edward Alp and Dorothy Wilson on February 19th 1698, at Finsbury. In France, Jean Nicolas Alp was christened on April 11th 1869 at Hestroff, Moselle. A Coat of Arms granted to an Alpe family of Norfolk depicts a fesse ermine between three silver alpes on a blue shield. The first recorded spelling of the family name is shown to be that of Matilda Alpe, which was dated 1275, in the "Hundred Rolls of Norfolk", during the reign of King Edward 1, known as "The Hammer of the Scots", 1272 - 1307. Surnames became necessary when governments introduced personal taxation. In England this was known as Poll Tax. Throughout the centuries, surnames in every country have continued to "develop" often leading to astonishing variants of the original spelling.